This spacious duplex apartment is situated in the typically Provencal village of Roussillon, in the heart of the Luberon Nature Park. 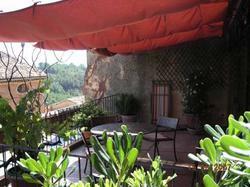 It opens up to a furnished terrace with views of the village. All rooms are decorated in a traditional Provence style and offer free Wi-Fi. Guests are invited to relax by the fireplace in the apartment?s TV lounge, which offers views of the hills and the village. La Maison d'A Coté presents a kitchen equipped with a dishwasher, a refrigerator and a microwave. Meals can be enjoyed in the dining area or al fresco on the terrace. The city of Apt is a 20-minute drive from the apartment and Carpentras is 38 km away. The apartment is 48 km from the Avignon-Centre Train Station. Bed linen, cleaning and breakfast are included in the room rate.